Call For Papers: Why Europe? We hereby open this year’s Call For Papers. Anybody who’d like to give a talk or present a project at Reeperbahn Festival Conference 2018 is now welcome to submit a proposal by 30 April 2018. Additionally we’d like to ask for contributions to this year’s special thematic strand titled “Why Europe?”. Here, we’d like to hear about your cultural ideas and visions, your political hopes and fears, your economic experiences and analyses for the continent from a music industry perspective. We’ll provide a venue equipped with the necessary conference technology, an interested audience – about 4,500 music industry and business professionals attend the conference – and we’ll promote the proposed event as a fully-fledged component of the Reeperbahn Festival Conference programme. In addition, you’ll receive full accreditation for the Reeperbahn Festival with access to 900+ concerts, arts activities, and conference events. First step: Use this online form to submit your proposal by 30 April 2018. The Reeperbahn Festival Conference is Europe’s platform for the music and digital creative industries, with industry professionals from more than 50 countries that meet, network, and take part in a programme of more than 200 events. We’re now offering meeting spaces near the conference centre for the exclusive use of our partners – for planned and impromptu conversations, as a permanent networking meeting point, and for establishing and cultivating contacts. The number of meeting spaces is limited. Contact Joana Hoch to plan your networking event at Reeperbahn Festival Conference 2018. During Reeperbahn Festival a total of five concerts will be held at Hamburg’s new landmark the Elbphilharmonie. 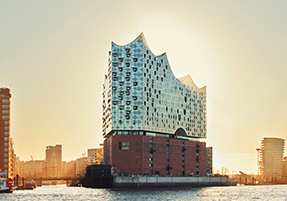 Those who would like to attend one of the Elbphilharmonie concerts can purchase a Conference Ticket and request a reservation at the same time. Be quick as capacity is limited. Ticket holders who purchased a Conference Ticket before 10 January 2018, have until tonight 6:00 PM to reserve a concert at the Elbphilharmonie during Reeperbahn Festival 2018. Learn more about the reservation system and the acts playing.